Australia is emerging as a dominant competitor in the men's Senior B events - thanks to Reinhold Batschi's insistence that this category for under 23 year olds is the key area in which to invest time and talent. East Germany and Czechoslovakia now participate in the 'Match' and as other eastern European countries will soon follow suit the standard of racing looks set to rise markedly. The highlight of the team's lead-up regattas occurred at the Amsterdam regatta on 11 July. The four, pair, sculler and reserve Jordi Martens combined for a one-off attempt at the feature eight-oared event on the programme. According to Mark Doyle the eight was "fantastic fun and relaxed the whole squad" - well it might; Australia won effortlessly, six lengths ahead of other crews. The US were second and Holland third. At Vienna pride of place went to Victoria's David and Mark Doyle who won the gold medal in the coxless pairs event. In the final they led from the start -having 3 seconds in hand after 5OOm, 4 seconds at the 1000m mark and 5.5 seconds at the finish. Switzerland challenged fiercely during the third 5OOm, but no other crew looked like giving trouble. The coxed four performed almost as well to gain the silver medal. In 1981, Australia came sixth in this event. 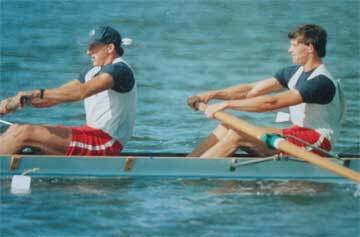 The 1982 crew-Mike Nielsen (SA), David Rose (Qld), Ian Edmunds (Qld), Graham Edmonds (NSW) and Steve Annear (WA) cox - were beaten only by West Germany. The team's sculler Tony Lovrich (WA) came sixth. Australia came fourth out of eighteen on aggregate points, after competing in only three events. Most countries entered representatives in all seven events.